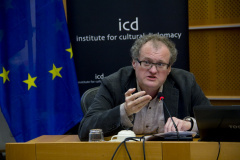 Dr. Leonidas Donskis was elected to the European Parliament in 2009 where he belongs to the Alliance of Liberals and Democrats for Europe (ALDE) group. He is a member of the EP Subcommittee on Human Rights and also Coordinator for this subcommittee for ALDE, as well as a member of the Committee on Development. He participates in the activities of the Delegation to the EU-Armenia, EU-Azerbaijan and EU-Georgia Parliamentary Cooperation Committees. 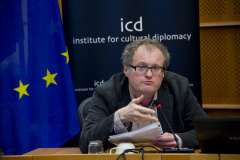 In 2012 Donskis was appointed as EP Rapporteur for the Annual Report on Human Rights and Democracy in the World 2011. He has PhDs from the Department of Philosophy in Vilnius (1990) and another from the Department of Social and Moral Philosophy of the University of Helsinki (1999). He also received an honorary Doctorate from the University of Bradford in 2010. He was Professor and Dean at the Vytautas Magnus University School of Political Science and Diplomacy, in Kaunas, Lithuania before being elected to the European Parliament. He is also a visiting professor in several universities, including Bologna, Helsinki, and Tallinn. 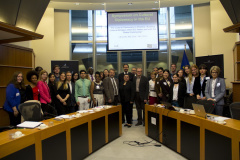 A Lecture by MEP Leonidas Donskis, Member of the European Parliament.